Five people were killed in a fire at a camp for those displaced by Boko Haram violence in northeast Nigeria, an eyewitness and a humanitarian source said on Friday. The blaze broke out on Thursday at the camp housing some 7,500 internally displaced persons in the garrison town of Monguno, in Borno state. The displaced people were preparing a meal when the fire broke out, gutting makeshift tents. “Five people were killed in the fire — three children and two women,” an aid worker with a humanitarian agency in the town told AFP. “The fire started from the kitchen around 11:30 am (1030 GMT) and spread all over the camp,” added the worker, who did not want to be identified. Witness Adam Sheriff said firefighters tried in vain to put out the inferno which gutted the camp in 40 minutes. 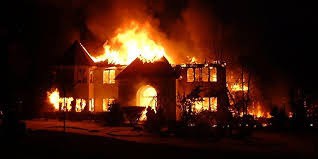 The National Emergency Management Agency (NEMA) later confirmed the fire, although it said three people were killed. “The fire occurred… from one of the makeshift shelters where a woman was cooking and spread across the camp, destroying 402 reinforced/transitional shelters,” said NEMA director-general Sani Datti. More established camps for the displaced in northeast Nigeria have formal, canvas tents but newer ones see people build shelters using branches and dried grass. More than 7,800 people were affected at the camp, which was located inside a local stadium, the agency said. Monguno is some 140 kilometres (85 miles) northeast of the Borno state capital, Maiduguri, and houses tens of thousands of displaced people in sprawling camps. Most of them had fled their homes in northern Borno and moved to Monguno to protect themselves against Boko Haram attacks. The town has seen an influx of internally displaced people from the fishing town of Baga on the shores of Lake Chad 60 km away, following attacks last December against a naval base and another for regional forces. Last month, the UN said more than 30,000 people fled to seek refuge around Maiduguri. Boko Haram’s decade-long insurgency has killed 27,000 people and displaced some 1.8 million in northeast Nigeria alone. The violence has also spilled into neighbouring Niger, Chad and Cameroon, creating a dire humanitarian crisis.